This entry was posted on November 2, 2012 by Tintean Editorial Team/fdg, in News, Travellers' Tales. Bookmark the permalink. Last year’s Bloomsday featured an inspirational seminar by John Gatt-Rutter, the biographer of Italo Svevo (pen name of Ettore Schmitz), the Triestine Jewish industrialist who became a friend of Joyce. I was going to say mentor, but the mentoring probably went in both directions: Joyce seems to me to have learnt how to be an adult from Svevo, and Svevo took heart as a writer from Joyce’s enthusiasm for his fiction. The meeting place was Trieste. Svevo was Joyce’s English student. He needed better English to operate his paint factories in England, and Joyce needed the wherewithal to butter his and Nora’s bread. Literary tourism is a strange monster – a bit mystical and very superstitious. Cities acquire the properties of second-class relics – one can reverently partake of some of their mana and metaphorically touch the hem or the coffee cup that might have touched the lip. One imagines that by entering into the life of a city, one can understand more of the fabric of the life, and the fabrications and confabulations which emanate from it. Trieste was on our 2012 travel agenda, mainly because of Joyce. We knew of its reputation, apart from the Joyce connection, as the Habsburg port, but we didn’t know that how much of a plaything of various cultures it had been: Venetian, then Austrian, and finally Italian, part of the carve-up after World War I when Italian irredentist claims were rewarded. One imagines that if Pope Leo XIII had succeeded in moving the Vatican there (in search of a more devout clientele) in the late c19, that it might not have been so attractive to Joyce. It was in his time, an extraordinary meeting-place of Central and Eastern European cultures, and music and literary debate were its lifeblood. The opera house occupies pride of place at the head of the grand canal that the Habsburg Empress had constructed when she built the new modern part of the city on reclaimed land in the late eighteenth century. Joyce often afforded it, so it can’t have been too expensive. 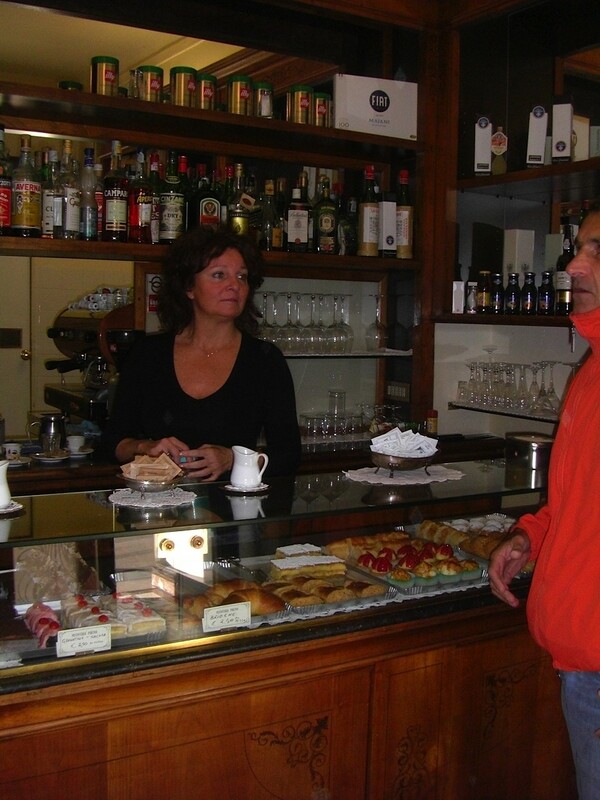 We were delighted that some of the old cafes had not lost any of their mitteleuropean flavor, and we fancied that our favourites might also have been His. Caffe Pirona topped the list, closely followed by Caffe degli Specchi with its extravagant canapés, and Matteo’s, rather stuffier, we thought, and a bit too formal except for a grand celebration. 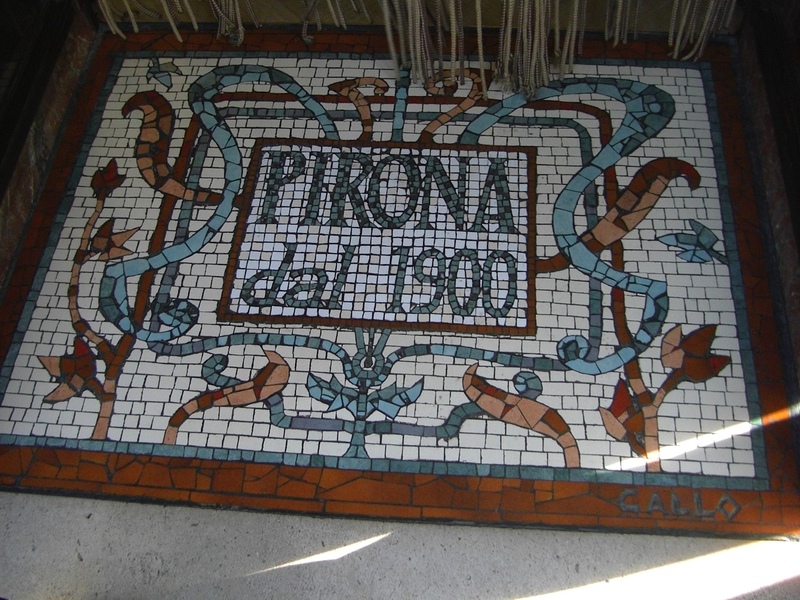 Certainly, there was no doubt at Pirona’s as to which pastries, still in production, had passed the sacred (more likely profane) lips. Cristina, grand-daughter perhaps of the early c20 proprietor, was pleased to advise us and lead us into temptation. Such different fare from Bewley’s. It is easy to imagine how exotic nut and raisin pastries must have seemed to the young woman from Galway via Dublin. 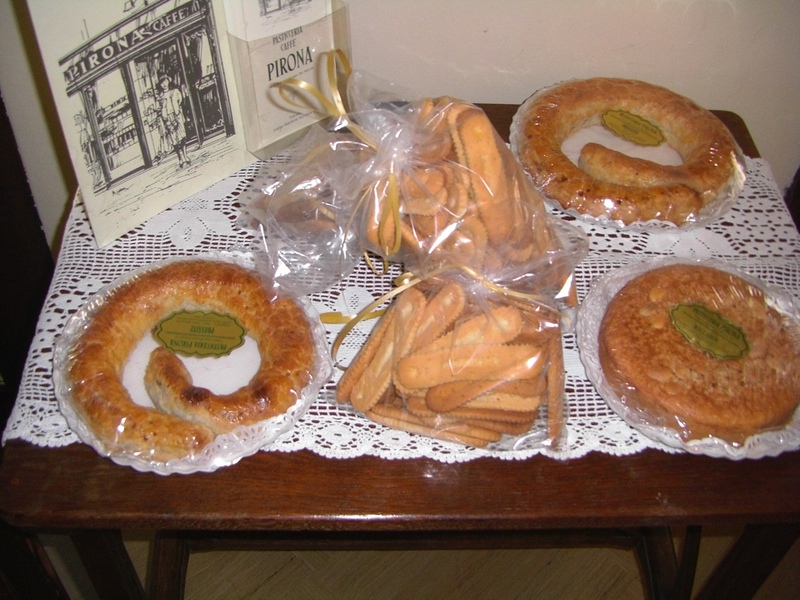 Nora, despite the family’s poverty, is reputed to have been a bit of a dresser, and one can imagine her parading, as the contemporary Triestine girls do, in the genteel parades in the heart of the city, listening to Serbian, Triestine Italian, German and a host of other languages. Other magnets for the Joyces were the Serbian and Greek Orthodox churches, especially San Nicolo. Like Dublin, Trieste is a walkable city, and often in sight of water. Joyce’s statue walks there, and we were pleased to walk also with Svevo and another Triestine poet, Umberto Saba. Just as Joyce had, we arrived by train, and immediately, cases in hand, took to the streets. The Svevo/Joyce Museum, in the City Library building, was hard to find in the Old City, but worth the hunt and even the circuitous and overly complicated route we took via the Roman Gate (getting lost on foot is the best part of being away and not on a timetable). 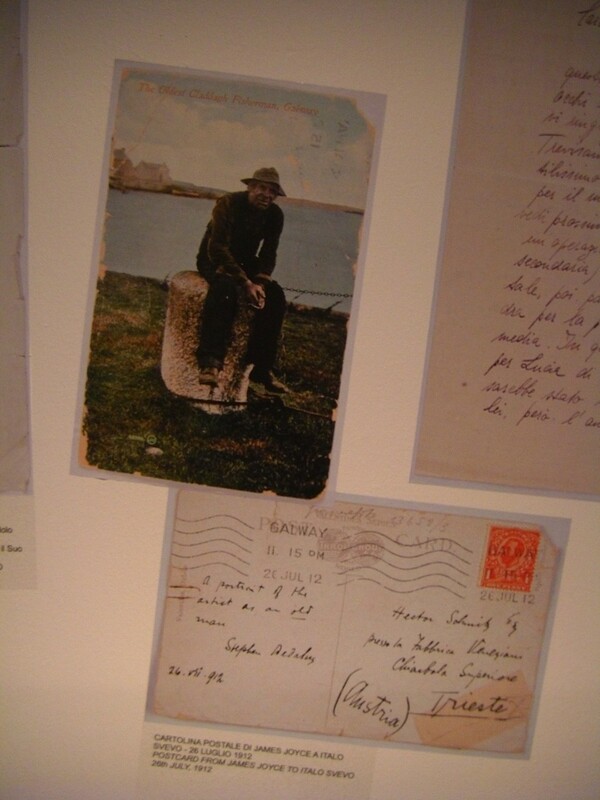 Among the treasures there was a postcard Joyce despatched to Svevo from Galway in 1912, four years before the novel’s publication, with an elderly Galway fisherman whom Joyce had tagged, ‘A Portrait of the Artist as an old man.’ Knowing that Svevo had read and commented on the first three chapters of Portrait (Joyce’s students were given unconventional homework), this little gesture of esteem says a lot about the ease of the young man and the older one. One of Professor Gatt-Rutter’s theories, well-attested, is that Bloom’s character owes a great deal to Svevo – his scientific cast of mind, his secular Jewishness, his protectiveness of the younger man, his curiosity and generosity, and it was moving to see Joyce’s letter to Svevo’s widow, Livia, marking the older man’s death in the first car accident in Trieste in 1928. It was dictated, possibly to Lucia, because of Joyce’s iritis. It was festa time, Barcolana, in Trieste while we were there, and the waterfront was alight with crafts of all shapes and sizes. All manner of mariners compete in many different classes of event – a truly democratic celebration of the sea. ‘More important than Christmas’, the locals said, and that was easy to believe. It’s a reminder of the free port and its long history of competition with Venice just 150k away. 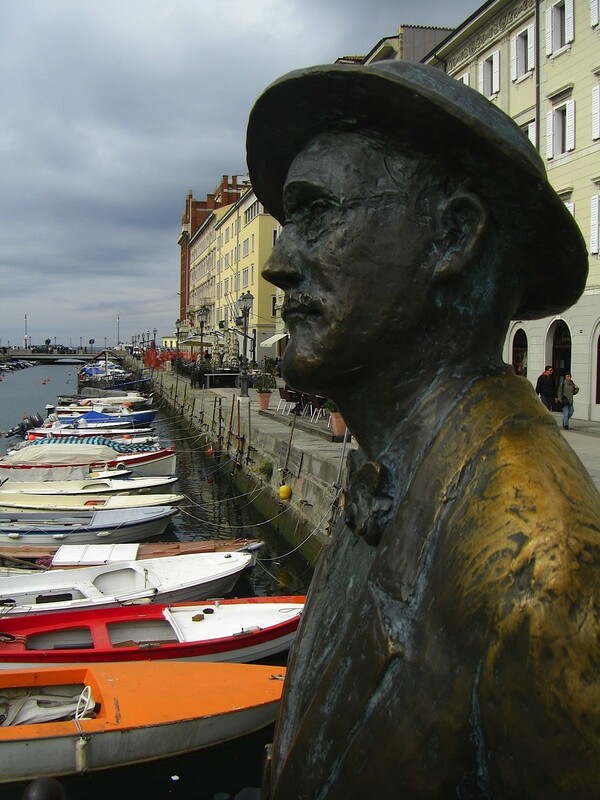 Trieste helped me understand something of the Europeanness of the reborn Joyce, and his cosmopolitanism. I cannot but have a soft spot for the kind of city that produces an industrialist who also writes novels, and who opens himself and his culture up for the kind of intense scrutiny of a (loving and generous) cannibal like Joyce. Frances is the Joyce-obsessed organizer of Bloomsday in Melbourne.